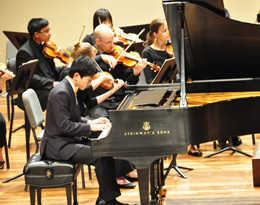 To be eligible to perform in the concerto Concert, you must be a student at the piano school for a minimum of 2 years, and currently be enrolled as a full-time student. Audition is held once a year during the fall semester. Participants will be decided by invitation only through the auditioning committee. Piano Accompaniment: $30 (payable to piano teacher). Participate fee includes DVD, pictures and 1 @half hr orchestra rehearsal and 1 dress rehearsal. Any extra rehearsals will at the cost of the participant. Participate fee includes DVD, pictures and 2 @ ¾ mins rehearsals and 1 dress rehearsal. Any extra rehearsals will at the cost of the participant. •	All participating on concerto or chamber students must sell a minimum of 15 tickets @ $20 a ticket = $300.00. •	Any Piano Teacher is coaching at your orchestra rehearsal or chamber music rehearsal is needed to pay respective piano teacher as a lesson fee on each rehearsal. 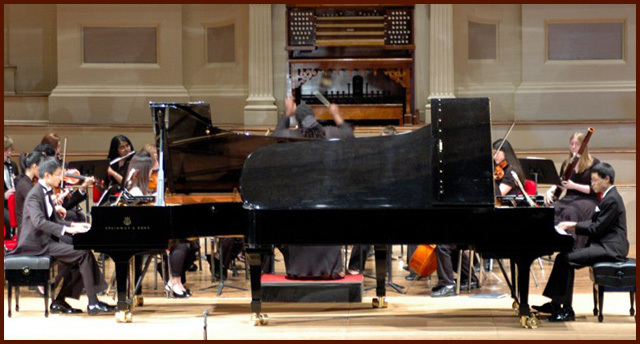 •	There is no refund once concerto payment or chamber payment have made to the Ip Piano School. •	Concert Performance Dress Code is strictly informed. Performers of the concert are expected dress appropriate clothes at the concert. Girl: Dresses should be below the knee and dresses with thin straps are not permitted unless worn with an outerwear that would provide necessary coverage. Men: Should be long-sleeve collar shirt, dark trousers, tie or bow tie, black socks and black shoe.